The National Energy Board's weeklong roundtable on Arctic offshore petroleum operations begins in Inuvik. A major roundtable on Arctic offshore oil and gas drilling began in Inuvik, N.W.T., on Monday. The National Energy Board is in the final stretch of a year-long review of the safety and environmental requirements for possible Arctic offshore petroleum operations. Over the last year, the NEB gathered information from scientists, the oil and gas industry, other regulators, environmental groups and northerners. This week, it’s bringing together interested parties for five days of discussions about how offshore drilling could impact the Arctic. Groups ranging from the Mittimatalik Hunters and Trappers Organization in Pond Inlet to the Canadian Labour Congress are slated to present their views. Representatives of oil giants Chevron, ConocoPhillips and Imperial Oil will also take the floor. More than 150 people have registered to take part. The NEB hopes to use the discussions to help formulate safety and environmental rules for Arctic offshore oil and gas operations. Currently, no companies are drilling in Canadian Arctic waters, but several have purchased exploration rights for swatches of the Beaufort Sea and hope to extract gas and oil from there. Imperial Oil has committed to spending $585 million drilling in the Beaufort, off the north shore of Yukon and the northwest corner of the Northwest Territories. But the company has said no exploration work will be planned until the NEB’s review is done. Exploratory drilling is already underway on the Danish side of the Davis Strait, between Nunavut’s Baffin Island and Greenland. The area has large reserves of oil and natural gas that could be opened up to exploration on the Canadian side as well. 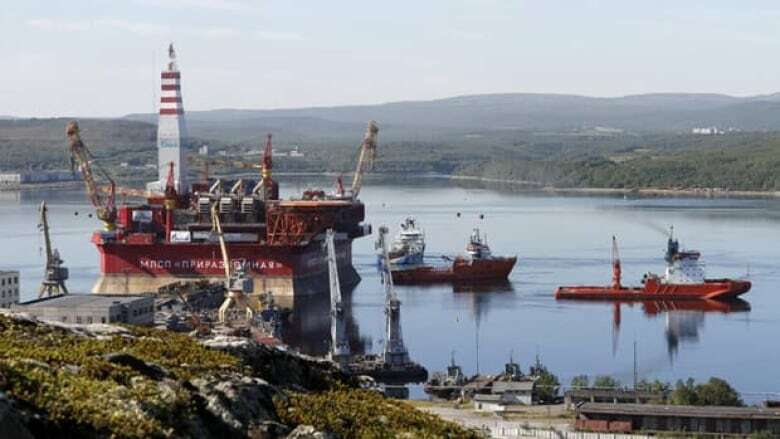 Russia aims to have a commercial rig operating in its Arctic territory early next year. The roundtable begins on the heels of two damning reports released by environmental groups last week. Oceans North Canada on Friday urged the federal government to put the brakes on Northern offshore oil-and-gas development because of the extreme difficulty of cleaning up a spill. Oil companies assert they could recover 90 per cent of any leaked petroleum from Arctic waters, but in last year’s BP spill in the Gulf of Mexico — which took place close to emergency equipment and in a clement climate — only 20 per cent was recovered. Any spill in the Arctic Ocean would face moving ice, punishing sub-zero temperatures and brutal storms with hurricane-force winds, Oceans North Canada’s report said. Plus, it would be hard to access the spill by land or sea because of the scarcity of roads and the huge distances from ports and coast guard ships. A report the day before from the World Wildlife Fund described how unready Canada is to properly manage a response and cleanup of an offshore disaster. Should approval for new Arctic oil drilling licences be suspended?